Whoops! Maybe you were looking for asplode? "Finally! A game that lets you blow things up!" Ummm... It's a game... with explosions... What do you think? "EXPLODE!!!" for the Nintendo DS is a video game developed and published by Bandai-Namco games, who created such notable titles as "Xenosaga Episode III" and... Ummm... Yeah... They did Pac-Man, right? I think they did. But that was a while ago. Huh. Damn. The object of the game is to destroy every object on the screen by "exploding" them. To do this, the player must touch objects on the bottom screen with their stylus. It has to be touched with the stylus. Attempting to touch it with something else will only result in the game not letting you EXPLODE things, and that makes the game less fun. "EXPLODE!!!" is claimed to be compatible with DS Wi-Fi-WTF, although it is not explained how. "EXPLODE!!!" was released in Japan on November 5, 2004 and in North America on December 14, 2006. "EXPLODE!!!" will never be released in Europe, because Europeans know better. In "EXPLODE!!!" 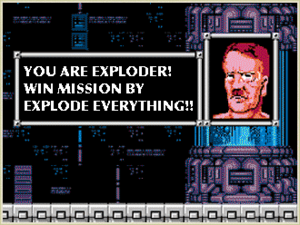 you play as a young unnamed EXPLODEr who is given the most important mission in his/her life by the Grand Council of EXPLODErs: EXPLODE EVERYTHING. You begin to ask yourself why you have to EXPLODE EVERYTHING, but it isn't your place to question your leaders. You are an EXPLODEr, and your job is to EXPLODE things (in particular, EVERYTHING) and not question it. And so you head to Earth in your EXPLODE-o-Ship to fulfill your destiny of being the greatest EXPLODEr and finally be invited to the EXPLODErs' Bi-Annual EXPLODErmas Ball. As you work your way through various levels, the targets to EXPLODE increase in scale all culminating in the final operation where you must EXPLODE the sun. After exploding the sun, and thus the entire solar system, you are treated with the ending for how many items and upgrades you got on Earth. Best Ending- If you get 100%, the Council of EXPLODErs award you with being the Greatest EXPLODEr ever, thus warping to another universe where you get to blow up stuff again. Normal Ending- If you get 80-50%, you are rewarded, but the council will not warp to the other universe. Worst Ending- If you get 40-0%, the sun EXPLODEs, but you get caught in explosion and die. The EXPLODEr: This is your character. You can choose it's gender. Very little is known about him/her, only that he/she graduated with honors from EXPLODEr Boomniversity with a Ph.D. in EXPLODE-ology and that he/she is the errand boy/girl of the Grand Council of EXPLODErs. His/Her primary weapon is a pair of "EXPLODE-o-Gloves". The Grand Council of EXPLODErs: A group of the most high-ranking EXPLODErs in the universe. They are so skilled and talented that they don't have to EXPLODE anything themselves, but instead send other people to do their work for them. Butlers, Potatoes and Dentists: These are the enemies that will try to thwart your quest to EXPLODE EVERYTHING by any means necessary. Tap them with the stylus to EXPLODE them the second you see them, or they will easily destroy you. A screenshot from a typical "Ground-sploding" mission. Watch out for Dentists! Ground-sploding: You are armed with EXPLODE-o-Gloves and charged with the task of exploding objects upon the ground. 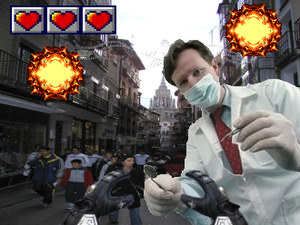 The action takes place from a first-person view of the exploder as you tap objects to EXPLODE them with the glove. You do not control the direct actions of the exploder, rather the exploder follows a set course, blowing up objects along the way by touching them with the stylus. Note that if you do not EXPLODE EVERYTHING in a level, you will fail and have to retry the entire level. The bystanders and pedestrians never seem to notice that the many objects and architecture are exploding around them, and if shrapnel hits them, they just fall down, get back up, and continue walking. The Potatoes, Butlers and Dentists, who are the primary enemies in "EXPLODE!!! ", simply appear on screen by "sliding in" from an unknown off-camera area. Butlers and dentists are represented by still images, and thus appear out of place in the environment, with people who move in full 3D. The very same Butlers and Dentists in the "Ground-sploding" missions are also featured in the "EXPLODE-o-Ship" missions. They do not have fighter planes or any type of flying device, nor is it made clear how they are able to damage your vehicle with their simple weapons. "EXPLODE!!!" was mercilessly panned for its somewhat spotty localization. "EXPLODE!!! ", for the most part, was not reviewed well. The game has an average score of 12% from GameRankings. Gamespot had stated that they found the game hard to take seriously due to its "insipid storyline that not even a four-year-old would believe" and its "uninspired and lazy enemy design". 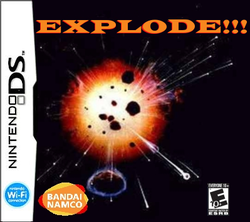 Game Informer referred to "EXPLODE!!!" as "Star Fox, but without the likable characters, real gameplay, or fun" and that it would be in Bandai-Namco's best interest if they "just stopped". Reviewers also criticized the English localization of the game, often saying that it made "Zero Wing" look like John Knowles' "A Separate Peace" due to lines in the game such as "Tap screen to create EXPLODE". All the negative press, however, did not stop Tommy Tallarico from blindly praising this game and giving it the "Tommy Tallarico Best Game Ever" award due to the fact that you can "blow up fire hydrants and dentists". ↑ If you actually went to GameRankings to look for a game called "EXPLODE!!! ", I am officially scared for our future. This page was last edited on 2 November 2014, at 06:45.